It's common to have a printer attached to your desktop or laptop PC. But what about printing from mobile devices, or printing when you're away from home? Cloud printing tech enables any Internet-connected device to access a printer via the Internet “cloud” of hidden resources. The device does not need any printer-specific driver software; that’s a big selling point for anyone who’s dealt with obtaining and updating drivers. Cloud printing enables you to send print jobs from your phone, tablet, laptop, a public computer, or anything else to a printer in your home, office, a library, or a specialty printing company, where your printouts will wait for you to pick them up (or be delivered to wherever you like). Simple jobs like printing photos from your phone will no longer require transferring image files from phone to computer, or plugging a SD card into a printer. If you do any document preparation (word processing, spreadsheets, etc.) on your smartphone or tablet, you can use cloud printing in the same manner, to avoid transferring the file to your computer before printing. If you need sophisticated printing functions that your home printer doesn’t support, you can send your document to a printing company as easily as to your desktop printer. You may even be able to dispose of your personal printer (as many of us would like to do). All of the major printer brands offer mobile apps which will connect your smartphone or tablet to a printer. Some print to a local printer using Wi-Fi. Others use an Internet connection or email to send printouts to local or remote destinations. Where Can I Print My Stuff? Office Depot offers a wide variety of printing services via cloud printing, for those who have registered accounts. So does Fedex Office, the office services division of the overnight delivery giant; you don’t need a business, just sign up and start printing. But both are kind of expensive for the usual consumer’s needs. Printers that support cloud printing natively don’t need to be connected to an Internet-connected computer; classic printers do. Google provides help to determine if your printer is cloud-ready, but any wireless printer that uses WiFi should able to support cloud printing too. Classic printers are connected to a home or office network, and one of the network’s nodes is a computer directly connected to the Internet. 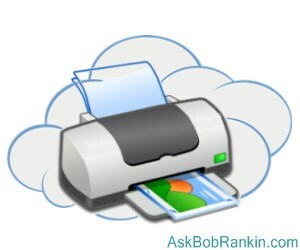 Google Cloud Printing can be implemented on that gateway computer if it is running Windows XP or higher and the Google Chrome browser; just follow these instructions. The Grand Rapids Public Library System is one of several library systems nationwide that offers cloud printing to the public via Google Cloud Print. Search for your library system and “google cloud print” to see if this marvelous library service is available to you. Prices will definitely be lower than commercial print shops. Most recent comments on "What Is Cloud Printing?" Seems pretty neat although my guess is Google (or anybody else that offers it for free) is mining print data so I'm not going to use it! But you need to be careful. Hackers have been targeting Internet connected printers. I recently bought a relatively inexpensive HP multi-function printer. The software lets you set up an email address for the printer. All you need to do is send an email to the printer - and it prints whatever you sent it. It's amazingly simple. But I rarely use it. I mean, think about it. If you need something printed, you usually need to be able to get to the printer. So why not just print it from your computer? I only find it useful when my wife needs me to print something from my computer, and I'm not home! Thank you for this article, being a technologically challenged senior gives me hope that I may fit in before I cash in. As Yehuda pointed out, "ïf you need something printed, you usually need to be able to get to the printer". I'm sure my local Office Depot would love to have me send all my printing needs to them at a $1 per page and a 20 minute drive one way to get there. Right now cloud printing seems like a technology in search of a need. My latest printer is one i have connect to my home network. I can send pictures etc directly from my PC (wired connection) and mobile phone (wireless connection) direct to the printer. Had to give it a fixed address or I could not print to it, if the router changed the printer's address. As ones others have said, it can be more costly and take far longer to get your printouts into your hands, than from your home printer. If you want a A1 poster made, then the cloud way could be useful way to transfer your image to the printer company.